We are now offering the ISL system for sale, with the understanding that the system is unproven as a platform for a successful closed-loop optogenetic experiment. You will find the ISL main page at Implantable Sensor with Lamp. We leave an A3030E inactive in tap water for three days with the two lamp pins separated by 5 mm. We see a white residue on the L− pin. After a week, the pin is covered with green residue. It breaks in half when we try to scrub it clean. Figure: Corrosion of Negative Lamp Joint after Three Days In Water. The charging diodes D4 and D3 CMDSH2-3 are reverse-biased, but they are Schottky diodes chosen for their low forward voltage during charging, and their reverse leakage current is of order 2 μA. This current flows out of the L− lead. Hydroxide ions in the water give up an electron to carry the current, resulting in a metal oxide and half a hydrogen gas molecule. The stainless steel springs do not corrode, even though we expect iron to corrode preferentially to copper during voltage=driven corrosion. Figure: Recharging Diodes. Diodes D3 and D4 conduct during charging. Their reverse leakage current flows between the lamp pins through water when the device is inactive. We encapsulate two lamp leads with an LED in clear epoxy. We attach the lamp to E157.3. We cover with 1.2% saltwater and pull with 1 N force on the leads 200 times. The next day, we pull 10 more times. 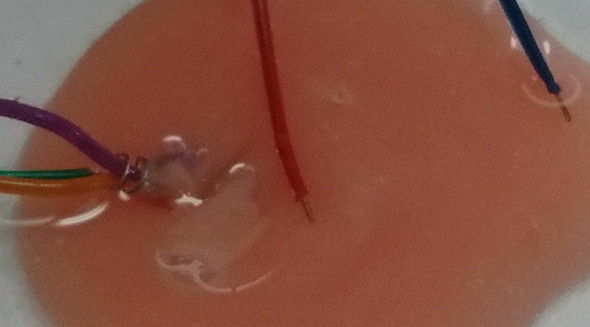 We can see a water film around the lamp leads where they pass through the epoxy. We observe lamp artifact of 800 μVpp when we place the EEG leads in the saltwater without the grounding spring and 40 μVpp with the grounding spring. The figure below shows the LED leads and solder joints after one day and ten days. >Figure: Lamp Encapsulated in Clear Epoxy, Immersed in Saltwater. Top: Day One. Bottom: Day Ten. Note the clear epoxy dome of the LED is almost invisible now that it is immersed in a larger body of clear epoxy. 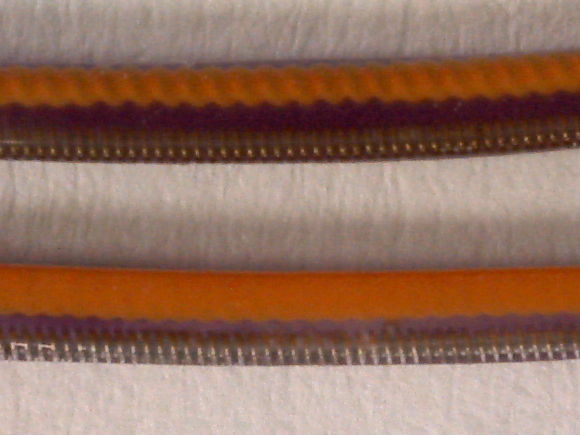 After fourteen days, we pull the purple and orange wires out of our epoxy fixture. The purple wire snaps where we scratched it to remove insulation. 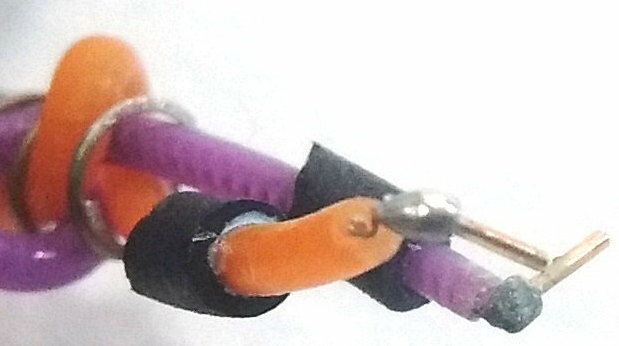 The orange wire breaks at the edge of the solder joint. We remove silicone from the end of the purple lead and examine the steel. The surface is untarnished. A better choice of diode would be one with far lower leakage current, such as a PN-junction small-signal diode. We connect the cathode of a 1N4448 to +3V, a wire to the anode, and a wire to 0V. We put the far ends of the wires in water. The anode wire models the L− wire in the A3030E, but the 1N4448 reverse leakage current is of order 20 nA. After two weeks, we see no corrosion on the wires. The corrosion caused by the 2-μA leakage current of the CMDSH2-3 does not spread to the stainless steel of the leads and is suppressed cement on the surface of the copper parts. In future versions of the ISL, however, we will use low-leakage silicone diodes in the battery recharge circuit so as to avoid electrically-induced corrosion altogether. 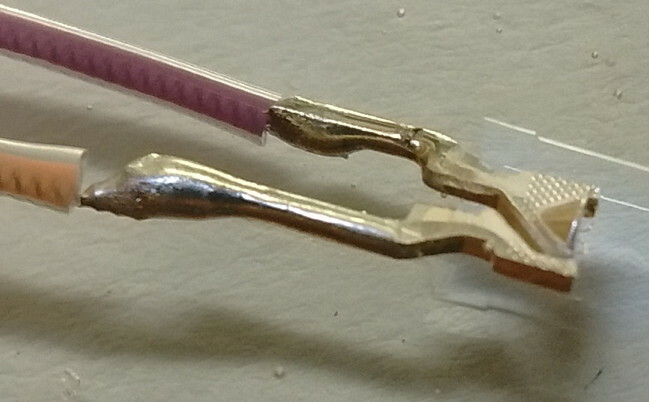 The photograph below shows the A3030E lamp leads with ground spring, strain relief, and collars. Each lamp lead we wrap around one coil of the spring. When cemented in a head fixture, the spring will be rigid and the wrap of the lamp leads will provide strain relief for the two 3-mm black head shrink collars. The collars are glued to the lamp leads. Figure: A3030E Batch E157.3-14 Lamp Leads. 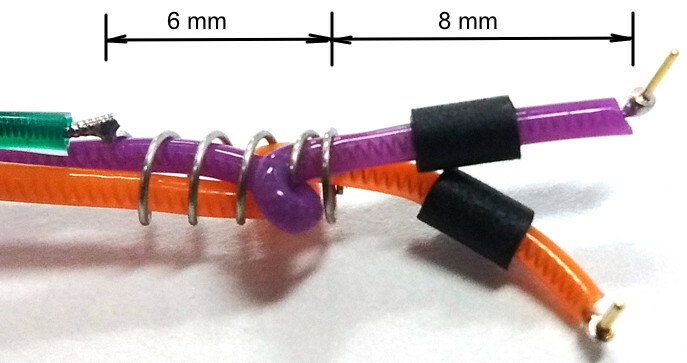 We have two leads wrapped around spring coils for strain relief. We test the above arrangement in a mock dental cement fixture, shown below. From previous mock fixtures, we learn the dental cement must be allowed to cure for fifteen minutes while stationary so as to ensure that the cement will harden while tight around the collars, leads, and spring. In order for the grounding spring to be effective at stabilizing the potential of the animal body, here represented by the water in the perti dish, at least one coil of the spring must protrude from the head fixture to make contact with the body fluids. Figure: Mock Head Fixture for A3030E Lamp Leads and Grounding Spring. We cover the head fixture with water and place the lamp leads in the water with bare ends. We pull on the lamp leads with a 1-N force two hundred times. We flash the lamp 50 ms pulses 10 Hz full power. Total EEG noise is 8.7 μV rms. In the EEG spectrum we see a 7-μV harmonic at 10 Hz. We pull with a 2-N force on the leads another one hundred times. The total noise increases to 31 μV rms. We have broken at least one of the collar seals, and we see a 100-μVpp triangle wave on the EEG signal. Another hundred 2-N tugs on the lamp leads and the triangle wave is 140 μVpp. We vary pulse length and obtain the plot of noise amplitude versus pulse length. Figure: Lamp Artifact Amplitude versus Pulse Length for 10-Hz Stimulus and Head Fixture with Breached Collars. Water: EEG leads and head fixture in water. Saline: EEG leads and head fixture in 1.2% saline. Ground: EEG leads out of water, ground spring absorbing lamp current. We tug on the lamp leads some more. The lamp turns off. We adjust the leads and it turns on again. The lamp turns off. We adjust the leads and it turns on again. The lamp lead itself is broken. We now find that data transmission is being disturbed by lamp flashes. The lamp lead silicone insulation is broken. We cannot obtain consistent measurements of lamp artifact for any given pulse length, but the artifact can be as large as 2 mV when the broken lamp lead makes direct contact with the ground spring. We observe four stages of lamp artifact. In the Stage 1, lamp artifact is <10 μV rms. The collar seals and lamp leads are intact. In Stage 2, lamp artifact is <50 μV rms. The collar seals have been breached, but they are still tight. In Stage 3, the artifact can be as large as 200 μV rms. The collar seals are loose, with a thick layer of fluid to conduct lamp current into the ground lead. In Stage 4, the artifact can be as large as 2000 μV, reception can drop as low as 50%, and the lamp flashing is intermittent. One of the lamp leads is broken or its insulation has ripped. The current entering the ground lead is great enough to disrupt data transmission and lamp flashing. For Stages 1 to 3, lamp artifact for 10 ms flashes at 10 Hz is <50 μV. In Stage 4, the lamp may not flashing and data transmission is failing. We reach Stage 4 only if we subject the lamp leads to so much fatigue that they break. Given that our helical leads have a long record of surviving implants of many months, we are hopeful that we will not reach Stage 4 during an ISL implantation. We have two prototypes of our A3030E Stage 8 ISL circuit. The photograph below shows circuit E8.1 with all leads loaded, including grounding spring and a temporary white LED for our pre-production tests. Figure: Un-Encapsulated A3030E Circuit with Programming Extension. We test all the new features of the A3030E. After a couple of minor modifications, we find these features all work. In particular, the grounding spring and differential amplifier together reduce our simulated lamp artifact to 20 μV, compared to at least 30 mV for the single-ended input of the A3030D. We claim the A3030E with its additional grounding lead will not require a collar seal around the lamp leads where they pass into the head fixture cement. Antenna Switch: The A3030E shares a single antenna for data and commands. The crystal radio uses the antenna except when the logic chip is powered up and requests the antenna for transmission. 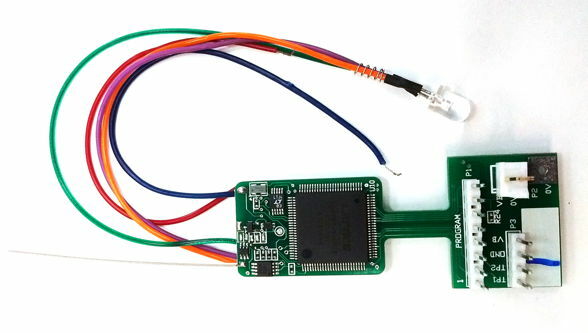 This sharing appears to work perfectly, with no loss of either data transmission or reception compared to the two-antenna devices. Crystal Radio: The new crystal radio layout is more compact. It provides more gain than the earlier 900-MHz crystal radios and extends the reliable command reception range from 50 cm to 80 cm. Battery Monitor: The A3030E measures its own battery voltage using its spare ADC input channel. We are able to monitor the immediate drop in battery voltage due to turning on the lamp, and the slow decline in battery voltage due to the lamp remaining on. The battery monitor will allow the Neuroarchiver to issue a warning before the battery runs down so far that it suffers permanent damage. Battery Recharging: We connect the L− to +8 V and the L+ lead to 0 V and charge the battery at a rate of 40 mA through the 75-Ω resistance of the lamp leads. The lead resistance and the charging diode voltage drops complicate the charging process, but with a specially-designed charger, we could re-charge them in the field in less than ten hours. As it stands, we can re-charge them in twenty-four hours with our own power supplies. Differential Amplifier: The A3030E EEG input is a differential amplifier. In water-filled Petri dishes, a 2-V lamp switching voltage applied to both EEG inputs produced no more than 100 μV lamp artifact. The differential amplifier is, however, vulnerable to 1 MHz switching noise from lamp modulation, which we use to reduce the average power of the lamp. In air, this modulation artifact can be as large as 200 μV, but within a conducting animal body we expect it to be negligible. At 100% brightness, however, this modulation artifact does not exist. Grounding Spring: The 3030E grounding pads allow us to attach a fifth lead to act as a ground in the tunnel made by the lamp leads as they emerge from the cement of the head fixture. We simulate an animal body with head fixture in Petri dishes. We use a tunnel resistance 100 kΩ, this being the minimum we have observed in our collar seal tests. 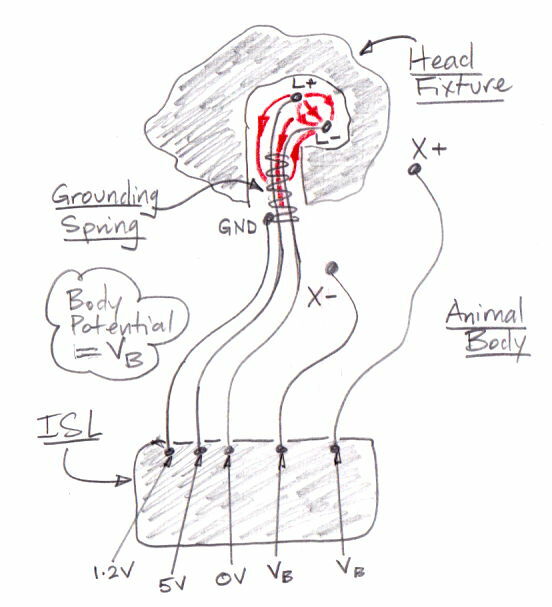 Without the grounding spring, the separated EEG electrodes pick up 500 μV of lamp artifact. The grounding spring reduces artifact to 20 μV. We initiated production of more circuits today, and expect to have them next week. We have a few bugs in the logic program to figure out, and the new firmware should provide one battery voltage measurement per second as part of normal operation, using the meta-data channel number fifteen. In Sources of Lamp Artifact we present our understanding of how lamp artifact of order 100-mVpp appears on the ISL's EEG signal when we flash the lamp. As we have reported before, this artifact is due to current flowing from the tips of the lamp leads, along the water-coated silicone insulation of the lamp leads, through the tunnels the leads make in the dental cement, and into the animal body. From there it flowed to the A3030C/D reference terminal for EEG monitoring. Figure: Lamp Artifact Current Flowing From L+ to X− When Lamp Is On. Voltages with respect to the implanted A3030D's 0V supply. Head fixture made of dental cement. Current in the leads is not shown. We later tried the A3030D-LO, lamp-only version, with a Subcutaneous Transmitter A3028E to monitor EEG. 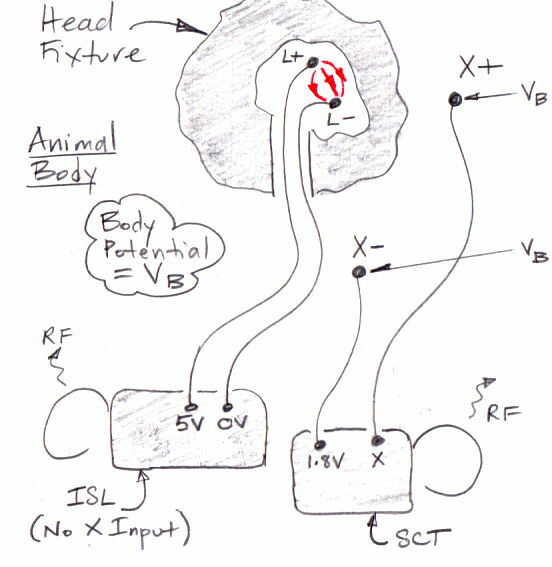 We saw no lamp artifact in the EEG we recorded, as the following diagram attempts to explain. Figure: Separate SCT for EEG, ISL without EEG for Lamp. Head fixture made of dental cement. One way to restore the ISL's own EEG measurement is to insulate the lamp leads with a ceramic collar, as we describe here. The ceramic collar makes is hard to explant and re-use an ISL because the solvent used to dissolve dental cement will also attack the adhesive we use to bind the silicone to the ceramic. The ceramic collar is arduous to assemble, and makes implantation of the head fixture more difficult. Furthermore, although we have tested the ceramic collar for fatigue resistance with machines and water here in our laboratory, we remain uncertain as to its reliability during a two-month experiment. We propose to eliminate the ceramic collar. Instead of blocking the lamp current, we will absorb it with a coil of wire that enters the head fixture and wraps around the lamp leads. We will use a stainless steel compression spring for the purpose. For EEG detection we will use a differential amplifier in the A3030E rather than a single-ended amplifier. The current flow in the head fixture and animal we expect to be as shown below. Figure: Grounded Seal Arrangement. Head fixture made of dental cement. Our initial tests of this arrangement are promising. We await the arrival of the A3030E circuits, when we will be able to test the arrangement with a differential amplifier built into the ISL. UPDATE: Here is a prototype grounding arrangement. A stainless steel spring is coiled around two lamp leads. Figure: Grounding Spring Coiled Around Two Leads. We can slide the spring up and down the lamp leads, but the lamp leads are pressing outwards against the coils. If the spring protrudes from the head fixture a few millimeters, it will provide a grounding point for our EEG measurement. Because it is wrapped around the lamp leads in the tunnel they make through the head fixture cement, the spring will absorb all lamp current that might flow through the tunnel. 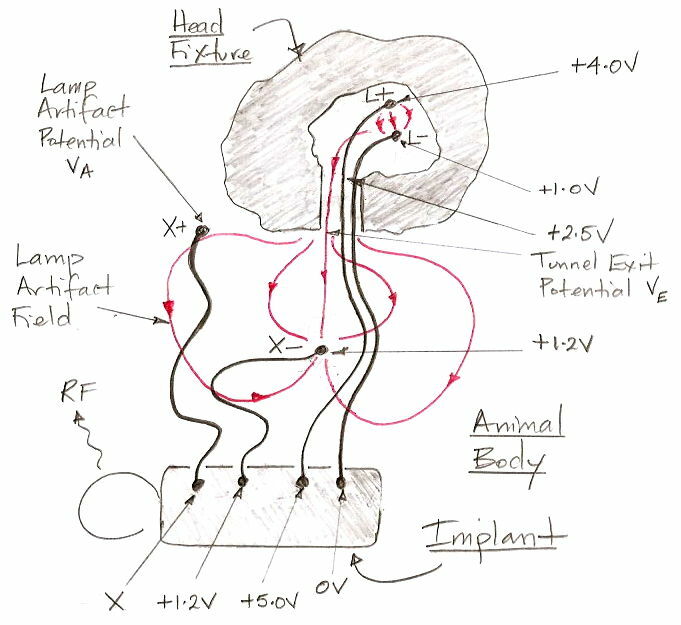 Instead of a sealed ceramic collar to isolate EEG from lamp power, we propose for the A3030E to add a grounding spring around the lamp leads to absorb the lamp current that leaks out of the head fixture through the tunnels in the dental cement made by the lamp leads. Running to the head fixture we would have three leads: L+, L−, and GND. The GND is the ground connection. On the A3030E circuit, GND is connected directly to the 1.2-V power supply. We consider joining these three leads together in a triple-helix lead, as shown below. Figure: Triple-Helix Leads. Top: 1 coat on individual leads followed by 2 coats on three together. Bottom: 2 coats on individuals, 1 coat on combination. As we report here, these leads provide perfect electrical performance. But we find it impractical to prepare the ends for application of pins and a grounding spring. We must cut the wires apart and remove silicone from each tip without damaging the lead elsewhere. For now, we plan to stick with the well-tested individual wires, and hope that they do not take up too much space. So far, the ISL lamp leads for all versions of the A3030 device have been 100 mm, stretched MDC-13867A stainless steel springs with resistance ≈30 Ω. The buck converter on the A3030 supplies 5.0 V to one end of the lamp leads, the LED forward voltage is ≈3.0 V, leaving 2.0 V across the leads. Of the power delivered by the buck converter, 40% is lost in the lead resistance. In the past, we have tried to increase the maximum optical power emitted by the tip of the ISL fiber. We found that a 15 mW fiber-tip power could produce circling behavior with 2-ms pulses at 10 Hz. If we were to use 100-mm un-stretched leads, their resistance would be ≈60 Ω and fiber tip power would be 7.5 mW. We could then flash the light for 4 ms instead of 2 ms and emit the same number of photons, thus producing the same ontogenetic effect. The energy we lose in the lead resistance will be the same. In the A3030E, we propose to either increase the lead length to reduce strain on the head fixture, or to keep the lead length the same and use an un-stretched lead to achieve the same reduction of strain.